The Road to the Horizon: News: Darfur peacekeepers: UN-armed or unarmed? 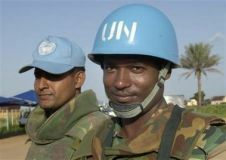 On April 9th, gunmen have attacked a UNAMID (UN African Mission in Darfur) police patrol, two kilometres (one mile) from the Zam Zam camp for internally displaced persons. The officers were ordered out of their vehicles and the four gunmen stole their personal belongings and official identity cards. One officer was repeatedly hit in the neck by the back of an AK-47 when he hesitated in obeying instructions to get back into the vehicle.